Don't worry, he's smiling because I'm going to take care of him. We are lucky here in the Bay Area. The San Francisco Bay Area is home to beautiful beaches, hills, and parks. The weather here and in the surrounding areas lends it self to some of the best farming regions in the world (think Napa). Demand here for high quality ingredients is quite high, and the farmers and farmers markets cater to our call. We have incredible visionary restaurants and chefs who are leading our country's healthy food movements. For these resources I feel truly blessed to be living in this culinary mecca. There is one distinct food that is a native treasure of the San Francisco Bay Area that I only recently came to truly appreciate. 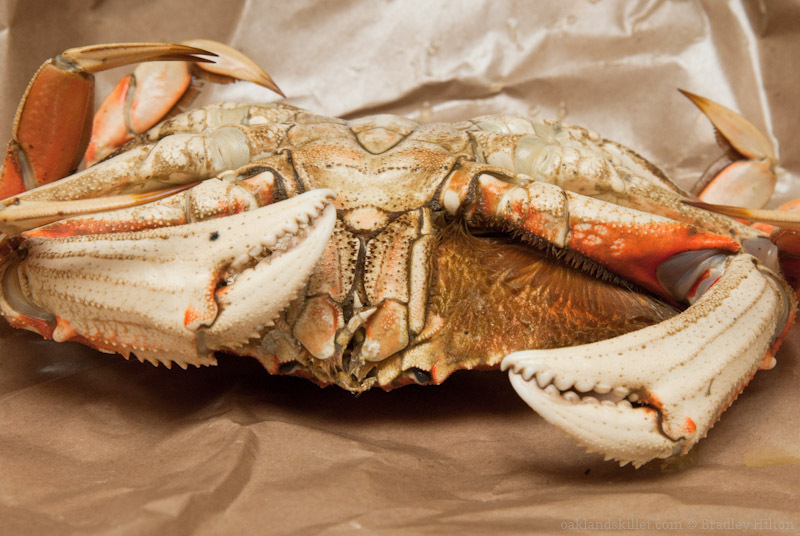 Dungeness Crab*. In my formative years I probably ate Dungeness Crab a hand full of times. It wasn't until one of my best friends started working at a butcher shop that I became really excited about Dungeness Crab. The Dungeness Crab, in my humble opinion, is a second to no other crustacean. Lobster has too much of a snap in its texture for me, and its flavor just doesn't come across as well while you chew. Dungeness Crab, on the other hand, has a wonderfully delicate texture, the flavor close to that of fresh sea air with just a hint of sweetness. Due to the crab's delicate flavors and texture it should always be featured with ingredients that support its characteristics. Serving Dungeness Crab with cheese, heavy cream sauces, or along side any land dwelling animal would be a mistake in my opinion. Of course Crab Cakes, salads featuring crab meat, crab salad (with only a modest amount of mayonnaise), and just plain Dungeness Crab with butter are excellent ways that highlight this delicacy. I've made frittata's, eggs benedict, and simple pastas with Dungeness Crab. All with marvelous results. One of my objectives with Oakland Skillet is to explore the seasonal foods and tune my recipes to take advantage of our regional opportunities. Yesterday I was I was thumbing through one of my cookbooks contemplating recipes for my next post to Oakland Skillet. I came across a recipe for Lobseter Risotto. Given my nature to one-up the recipe I immediately thought Dungeness Crab. I did a quick Google search to see if the Dungeness Crab season had opened. Good timing! 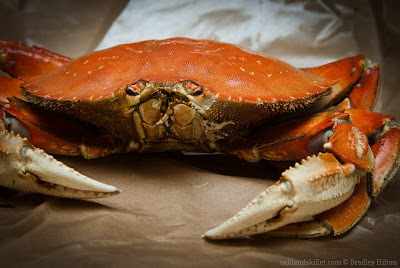 Dungeness Crab season opened November 28, 2011. *Dungeness Crab is also a responsible choice as far as seafood goes. It has been rated a Best Choice on the Monteray Bay Aquarium's Seafood Watch. If you don't have crab stock already you can use the shells of the crab to make your own crab stock. If you boiled or steamed the crabs yourself then use that same water to make the stock. Shrimp or lobster stock could also be used. Add the saffron to the stock and heat to a simmer. Keep the stock simmering on the stove while making the risotto. Place a 12 inch skillet over medium high heat. Add the olive oil, onion, bell pepper, and tomato paste. Saute until the onions become translucent but not browned, 6 - 8 minutes. Add the rice and stir until the rice becomes opaque, about 4 minutes. Add the wine and 1/2 cup of crab stock. 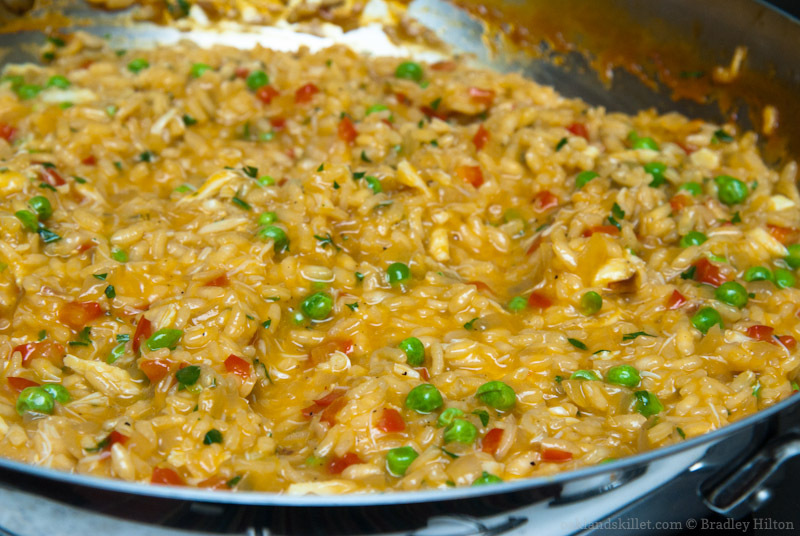 Allow the rice to absorb most of the liquid before adding more. Stir constantly and keep adding 1/2 cup at a time as the rice absorbs the liquid. After about 15 - 20 minutes the rice should be al dente. Add 3/4 of the crab meat and the peas. 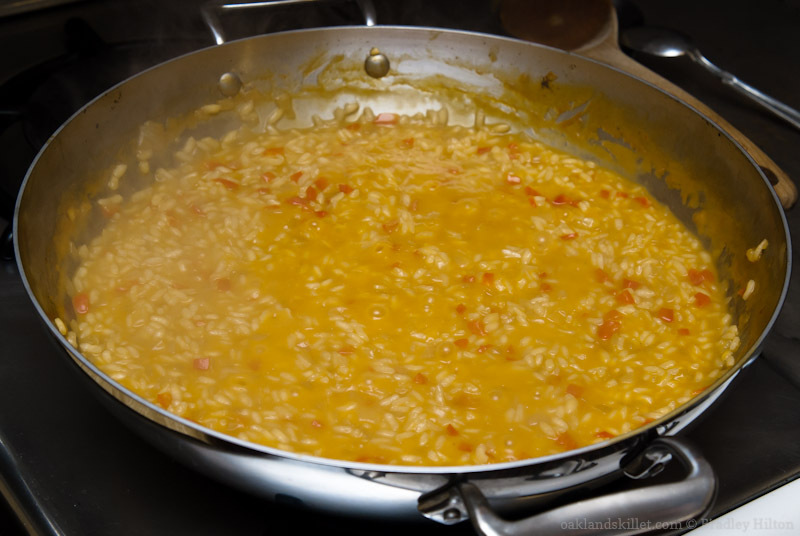 Stir for 2 minutes adding more stock to keep desired consistency (the risotto should be thin enough that it will slowly flow back to level if disturbed, but it should not resemble thick soup not a soup). The risotto may not take all of the stock. Remove the pan from the heat and add the butter and parsley and stir. 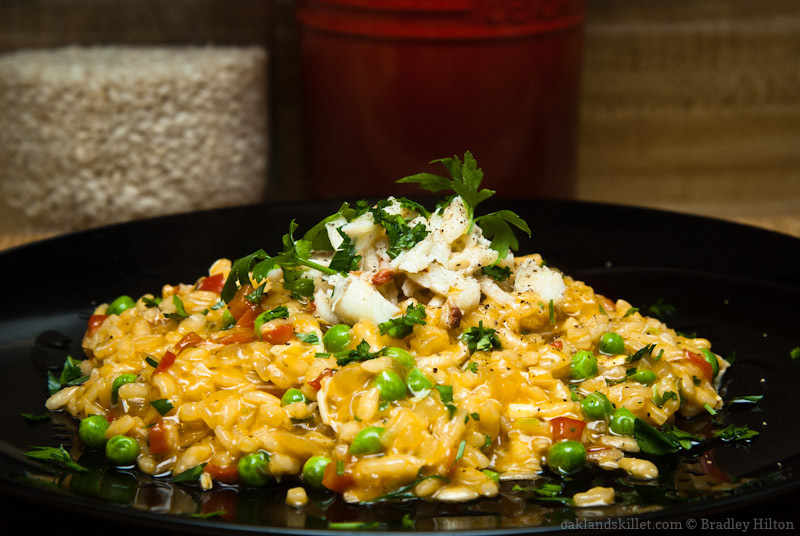 Serve the risotto immediately topped with the remaining crab meat. Garnish with parsley, olive oil, salt, and pepper. Notes: Whatever you do, don't add cheese to this risotto. Crab is to delicate a flavor for cheese. There Sea Salt makes a big difference in this recipe. If using frozen stock I like to add a chopped carrot, a few chopped celery stalks, and an onion to the stock while I bring it up to a simmer. 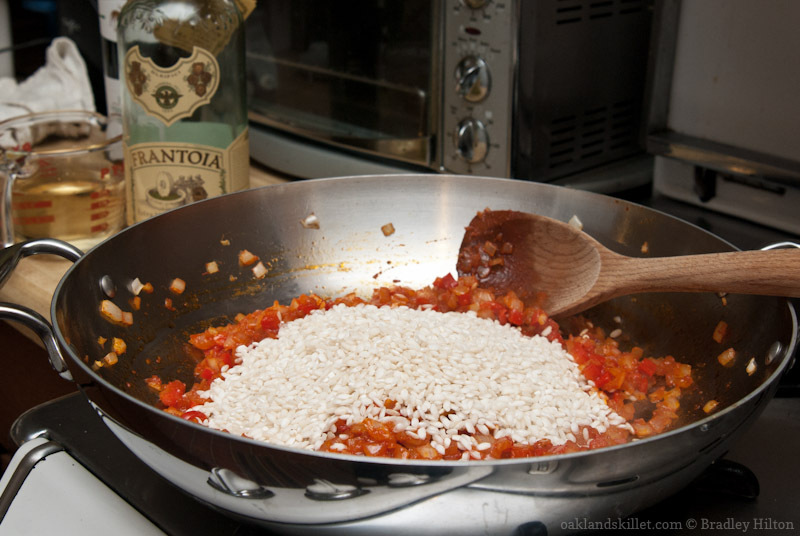 Adjust your stock for salt, but be careful as the stock reduces while cooking the risotto, so it will become saltier. I like the suggestions as to how not to obscure the wonderful fresh taste of crab. Really forget that Newburg, that Thermidor!! Stefany, this will serve 4 - 6 depending on what you serve it with. I had it as dinner.